"I Can Change" is a song by American rock band LCD Soundsystem. The song was released as the third official single from the band's third studio album This Is Happening, on July 26, 2010. It was written by band member Pat Mahoney and band frontman James Murphy and was produced by the DFA. The song was featured on the soundtrack for the video game FIFA 11 and peaked at number 85 on the French Singles Chart. 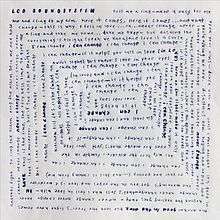 ↑ "Lescharts.com – LCD Soundsystem – I Can Change" (in French). Les classement single. Retrieved June 13, 2015.